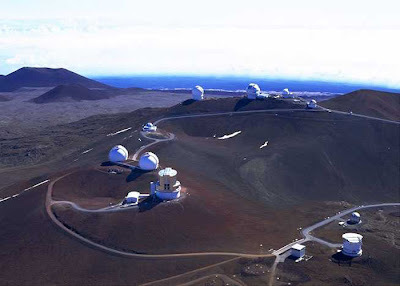 The University of Hawaii said Wednesday it expects to delay by about two years the start of a new asteroid-hunting telescope it plans to build at Mauna Kea's summit. Associated Press. The University of Hawaii is shelving plans to build an Air Force-funded, asteroid-hunting telescope on Mauna Kea. Tribune-Herald. The consortium that wants to build the Thirty Meter Telescope on Mauna Kea has sponsored robotics teams at local schools, downsized its proposed dome to be less conspicuous, agreed to ship all waste water back down the mountain, and pledged to train and hire local employees and contribute a million dollars a year to a local educational fund, among other concessions. Big Island Weekly. The State Department of Business, Economic Development and Tourism Energy Office has filed state and federal notices of intent to prepare a programmatic environmental impact statement for the Hawai‘i Interisland Renewable Energy Program. The PEIS will examine the program-level impacts of the development of up to 400 megawatts of wind energy on Maui County, the transmission of the energy to Oahu via an undersea cable, and the integration of that energy into Oahu’s electrical grid. Hawaii Reporter. The National Weather Service issued a flash flood watch this morning for Kauai and a flood watch will be posted for other islands later today. Star-Advertiser. The calm and quiet weather we've been seeing is expected to change dramatically. KHON2. With state House Speaker Calvin Say still one vote short of retaining power, dissidents are asking that he work with them to find a leadership compromise that will unify the House. Star-Advertiser. After five weeks of what they describe as an "impasse" over who should lead the state House of Representatives, 18 Democrats who want a leadership change are asking Calvin Say to give up his battle to stay speaker. Civil Beat. Following reports of nepotism at Myron B. Thompson Academy Public Charter School, Rep. Gene Ward (R-Hawaii Kai) announced that the $2.3 million in Federal Stimulus Funds recently released by the Lingle Administration for Charter School accreditation could help prevent these problems in the future. Hawaii Independent. A national study finds 20% of Americans spend more than they make - and in Hawaii, 24%. Hawaii News Now. The Library and Information Science Graduate Program at the University of Hawaii at Manoa has been cited as one of the nation's best.Associated Press. Tens of thousands of University of Hawaii students statewide are experiencing delays registering for next semester’s classes because of an overloaded computer system, UH officials said. KITV4. A record 784 lost, injured and underweight wedge-tailed shearwater fledglings have been turned in to bird caretakers on Oahu in the last 15 days, prompting concern for the native seabird. Star-Advertiser. The coqui frog has garnered quite a bit of attention in Hawaii during the last decade. Honolulu Weekly. Three adult corrections officers who worked at the Halawa Correctional Facility have been fired after a surveillance video showed them assaulting an inmate inside the prison. KHON2. Dog the Bounty Hunter and his crew chased down a suspect on Hawaii’s most wanted list and may consider going after the FBI’s backpack bandit. KITV4. The most hotly debated issue in Chancellor Michael Rota's tenure at Honolulu Community College was finally settled yesterday when he helped unveil a statue of a pistol with a knotted barrel designed to honor former Beatle John Lennon, who was assassinated 30 years ago yesterday by a former Hawaii resident. Star-Advertiser. Late Honolulu mayor Frank Fasi will be inducted into the Honolulu Marathon Hall of Fame Thursday. Hawaii News Now. The 13th Air Force plans to have a change of command ceremony this week as Lt. Gen. Ted Kresge takes over from Lt. Gen. Hawk Carlisle. Associated Press. Three more of Mayor Peter Carlisle's Cabinet appointees -- holdovers from the previous administration -- received initial approval from the City Council yesterday as the chamber completed its business for 2010. Star-Advertiser. The status of the Volcano House remains in limbo, with the National Park Service yet to decide who will operate the landmark hotel. Tribune-Herald. Hawaii County has settled a lawsuit filed against it by a paving company that alleged the county violated its own procurement code when it bought materials from a rival company. West Hawaii Today. Some coffee producers are expressing confusion in the wake of a new emergency rule creating two quarantine zones to halt the spread of the coffee berry borer on and off the Big Island. West Hawaii Today. Maui Memorial Medical Center's Kahului Tower was renamed The Representative Bob Nakasone Kahului Tower on Tuesday - an honor the longtime, self-effacing lawmaker probably would have shied away from. Maui News. The new owners of Na Koa Ikaika Maui baseball team are working with the county to make good on promised facility improvements that were not completed by the previous owners. Maui News. After a long wait, community members on Wednesday were supposed to be able to watch the live online streaming of the Kaua‘i County Council meeting. Garden Island. For months, Moloa‘a resident Hope Kallai has been watching a large yellow buoy roll over the reef in front of Lepe‘uli Beach, also known as Larsen’s Beach, on the North Shore. Garden Island.